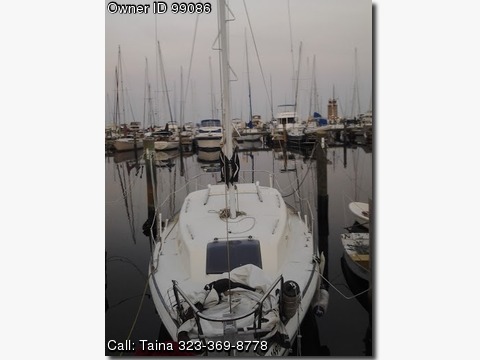 Please call boat owner Taina at 323-369-8778. Boat is located in St.Petersburg, Florida. I am selling my 1979 Watkins 27ft sailboat. I have been fixing her up over the last year. There is more to do to get her sail worthy. The really wonderful thing about her is you can live aboard this sailboat and the slip is transferrable It is a walk-in liveaboard situation. I have gotten all of the systems needed to liveaboard working. It has hot and cold running water, 2 sinks, toilet, stove, radio, cabin lighting, a stove, refridgerator, heater, air conditioner, 3 beds. I just had new electricity run with and new panel switches and it has two battery rechargers, except the running lights mast, front. The plumbing is all working. She has a large amt of water storage. Has more extras, radios, etc. Quite frankly, if you ever dreamed of cutting yr expenses and living in a marina, this boat can really fulfill this The environment is beautiful, and other dock liveaboards are friendly. Sails needed to be checked, needs a new Jib, Running lights, maybe more. Someone who knows about sailboats would be a great new owner and can finish the work I have done so far. If you know something about fixing boats and sailing, this could be a super deal for you and with a little work you could brave the seas with this sturdy fiberglass cruise sailboat. She is not for racing, more for comfort, with a 3.9 ft keel and 10 ft wide beam. She was created for sailing comfort. She is very large inside for this size of sailboat and was originally overbuilt on her fiberglass hull, standing rigging and mast compared to later models. She has been cleaned extensively inside and is really fun to hang out on. A 6 ft man can stand up in her. I can disclose everything that I know about her, I have been learning as I go. Ideally, you would know something about boats so you can sum up all information as I am not an expert. She will need an outboard motor as her motor was removed and the bottom glassed over. Hull is solid I had this checked. A used motor, short or long shaft can be purchased for a few hundred. Needs a new jib and new jib halyard. Will need some bottom cleaning. The boat is being sold As-Is. This type of sailboat when fully fixed up is selling being listed for 20,000. NADA listing for this boat is below with the extras it has. You can put some time and money into her and sell her for more than you purchased her for, if you ever want to. This sailboat wants to get out sailing, but needs someone a little more expert than I, so I decided to sell this boat and get a smaller one to learn to sail on. I am open to a part trade for a smaller sized boat 2500. I accept cash, cashiers or certified check, paypal or credit cards for payment. Call and we can make an appointment to see her.